The garage sheltered my bike through most of the past three rainy months. Now, daffodils nod in the March breeze and invite me back to this mode of transport. Bicycles have been a constant in my life, and I used them as a protective framework in a personal essay a couple of years ago. “Cycles” was published in Issue Two of Spry Literary Journal. I’ve reprinted it here, along with a link to Spry editor Erin Ollila’s interview with me in which I describe the “hermit crab essay” form that I used to explore the “soft underbelly” of fragile emotions about my mom. Wobble down the driveway and into the street. Chuck, stepfathering in after Dad died, unbolts the wheels and lets go of the bike seat. Mom clutches Chuck’s elbow. Roams with me and my cousins and grade-school friends around a little town and farmland in Southern Illinois. Banana seat. Butterfly handlebars with streamers. Chuck and Mom try on country life. Soon the Stingray rests in the barn, my exploration confined to hospital hallways and an incision on Mom’s bald scalp. Her tumor, benign. Her fear, incurable. Swerves through first job (proofreading at the local newspaper for the editor—Mom), first kiss, first chair in the flute section. Rusts in the garage through nursing school, first apartment, hospital jobs, Chuck’s death, and Mom’s grief. Wheels a Visiting Nurse bag and me around my inner city neighborhood in Southern Indiana. Chained and locked to dilapidated wrought iron handrails, always there when I returned. Companioned with my true love and his blue ten-speed. This work, this neighborhood, this marriage add to Mom’s losses. Cranks up the hilly streets of Seattle. Shimano components, three chain rings, and eighteen gears fuel the Burley trailer I pull. My twin toddlers’ helmeted heads bob to the rhythm of the wheels. On the phone, I describe this place to Mom, now in Florida with new love Steve, and three thousand miles from her only grandchildren. Transports me to graduate school classes at the University of Washington and training rides for 200-mile Seattle-to-Portland Bicycle Classic. Shiny black, all-aluminum frame rides out mental and physical tests. Mom and Steve visit our non-smoking house. Mom puffs cigarettes on the porch, exhaling smoke into the misty air. Glides into a new job at the county public health department. Bumps through visits to pregnant teens and colicky babies with diaper rashes and irregular sleep and drooly, toothless grins. Grinds gears with measles outbreaks, deaths from E. coli, and downsizing. Starts anew, pedaling to a bakery job and family hikes in a North Cascades village at the end of a lake. Spirals in the wilderness for two years with questions about work. No phones here. My hand-written letters assert new directions. Mom’s typed replies register qualms. Spins me to town and back on an island in Puget Sound. 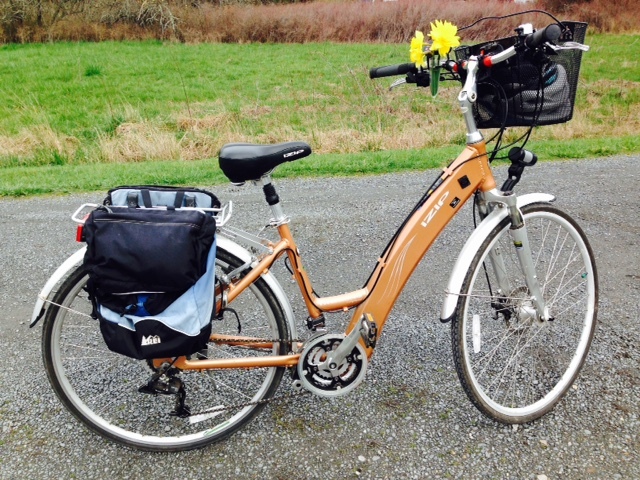 Copper-colored, electric hybrid model eases the strain of hills, headwinds, and rains on my stiffening back and weakening knees. Now my desk calls to me. Words on the page, on the screen, seeking to make sense. Mom’s ashes swirl in the icy bay. The current issue of Spry includes an essay by Northwest Institute of Literary Arts MFA classmate Heather Durham. “In My Hands” is another example of how writers reveal tender places that invite us to explore our own. I recommend it. Such a gift, Iris! The tender personal revealed through the progression of cycles. You write so authentically, so personally. I so appreciate how you invite us into your life! Thank you, Polly. This “hermit crab” form does make it easier to get to those personal places. I appreciate your comments.